Table: The Ranger shows how many spell slots you have to cast your spells of 1st level and higher. To cast one of these spells, you must expend a slot of the spell’s level or higher. You regain all expended spell slots when you finish a long rest. The Spells Known column of Table: The Ranger shows when you learn more ranger spells of your choice. Each of these spells must be of a level for which you have spell slots. For instance, when you reach 5th level in this class, you can learn one new spell of 1st or 2nd level. At 3rd level, you choose an archetype that you strive to emulate. Your choice grants you features at 3rd level and again at 7th, 11th, and 15th level. The hunter is the only archetype released by Wizards of the Coast as Open Game Content but there are variants or other archetypes available from other publishers (listed below). 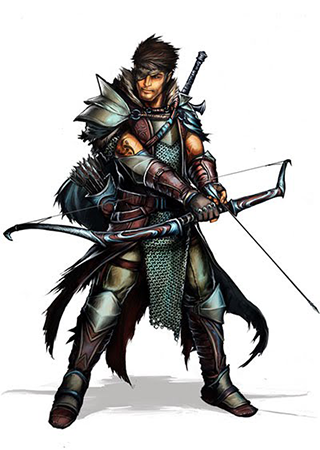 The ideal of the ranger has two classic expressions: the Hunter and the Beast Master. Only the Hunter is included in the SRD. Mechanical features of the Beastmaster will be added later.